Spring, the season of rebirth, calls for celebrating the fragrance and the splash of delicate color all spilling forth from the greenhouse. The winter toil to jump start the flowers now seems worth every bit of the effort. Who won’t savor the dewy fragrance of these blooms or long to touch their satiny petals? It’s time to sit back, relax and enjoy the fruits of your labor. 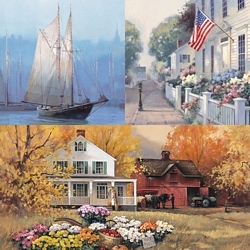 A Paul Landry painting will brighten a room by its very presence. Invite this "Greenhouse" into your home and watch the smiles of friends and family as they enjoy the view.